Have a Vaga 7 on my desk, when I get round to installing it I'll see how that does too. Damn you! It took me ages to get my score above your previous and right below 1080's. woox2k Damn you! It took me ages to get my score above your previous and right below 1080's. Tis why I ran it again. pete910 Tis why I ran it again. You have your table a bit wrong. some places are swapped Might as well use the Woox google sheets, i think its way nicer. 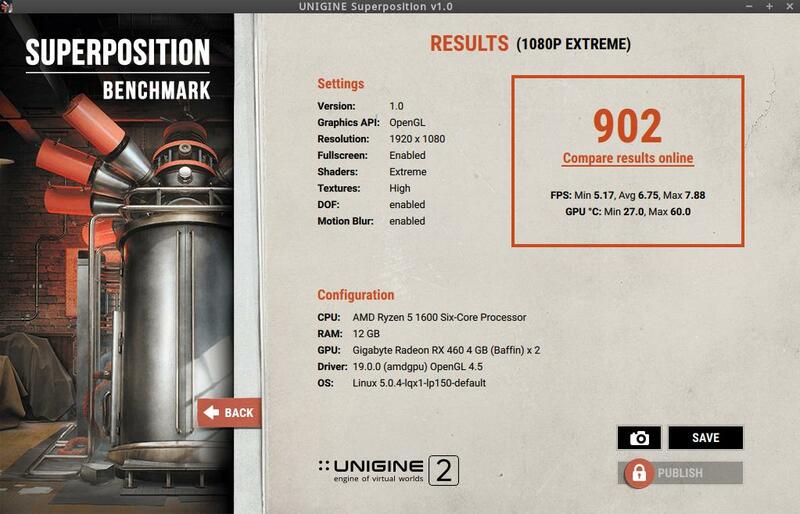 wired I'm getting worse performance with mesa 19, and I'm using the same kernel, any special tweaks? 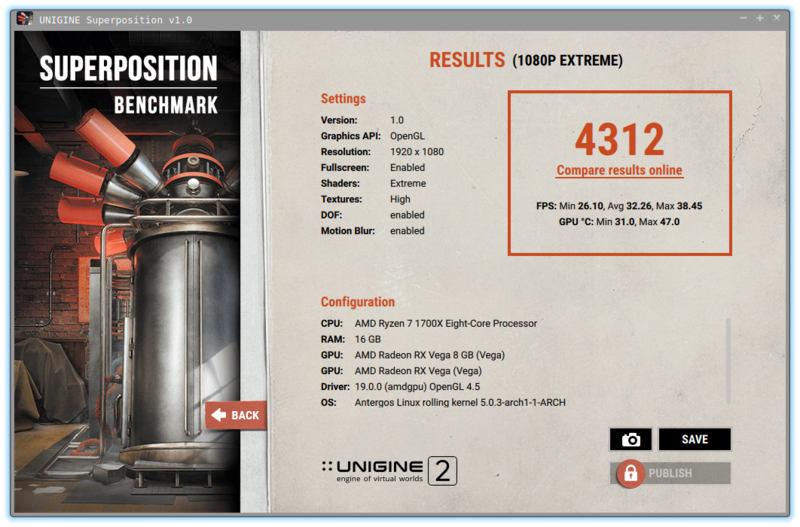 so overclocked the ddr4 memory and run unigine on ICeWM lightweight WM, I was expecting better results I guess that overclocking the ram doesn't make any difference really. at least now it runs on par with mesa 18, the problem was that mesa 19 needs llvm 8 I was using a repo that is compiled with llvm6, that's why I was getting worse performance. ps: on windows I could get with crossfire double performance but that wouldn't count as fair. The weird thing for me was that lighter WMs made it worse for me when i tried to squeeze every last bit out of my card. I tried. i3, awesome, twm(thatone didnt work at all), openbox and they all gave about 40-50 pts less than i was able to get with my MATE desktop and marco WM. Xpander The weird thing for me was that lighter WMs made it worse for me when i tried to squeeze every last bit out of my card. I tried. i3, awesome, twm(thatone didnt work at all), openbox and they all gave about 40-50 pts less than i was able to get with my MATE desktop and marco WM. it is not the case for me with KWin I get worse performance and even worse if composition is enabled.